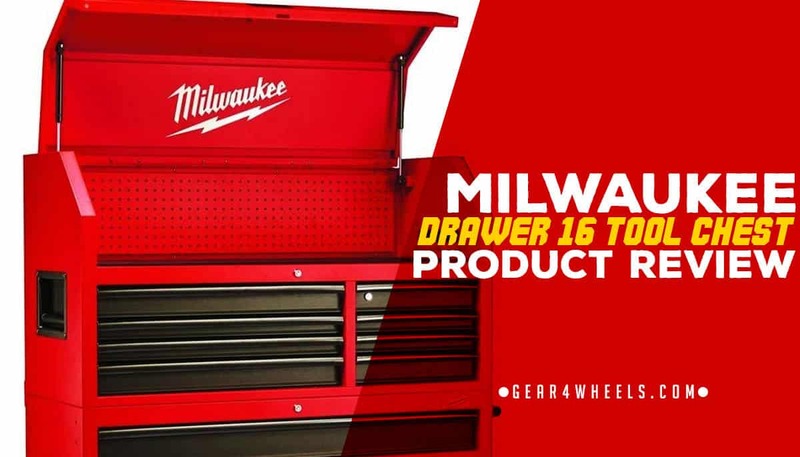 If you need a new tool cabinet, a really big one for all of the tools in your shop, the Milwaukee Drawer 16 Tool Chest is a good option to look at. It is big, has lots of drawers, and is very well build too. You should definitely read our Milwaukee Drawer 16 Tool Chest Review to find out more about it. The Milwaukee Drawer 16 Tool Chest is fairly safe. It does have locking drawers to keep tools where they are meant to be. The 1 star deduction is due to the fact that the top and bottom cannot be securely connected. The value for the money here is quite exceptional. It might seem like a lot of cash to spend on a tool cabinet and toolbox combination, but in our opinion, it is well worth the high cost. The build quality of the Milwaukee Drawer 16 Tool Chest is very high. It has a couple of minor drawbacks, but nothing that cannot be overlooked. When it comes to storage space, you will hard pressed to find anything that can fit more tools than this thing. The Milwaukee Drawer 16 Tool Chest is a really sleek and modern tool chest, a very large one with ample storage space. This guy is big, it’s heavy, and it’s ready to hold a whole lot of tools. 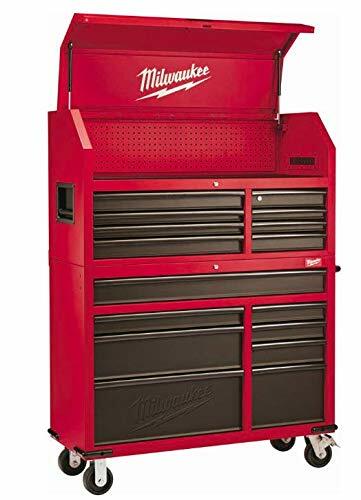 This is one of the newest and latest models in the Milwaukee lineup of tool chests, one that is proving to be one of the very best in its class for a variety of reasons. The Milwaukee Drawer 16 Tool Chest is ideal for any handyman, carpenter, home hobbyist, and anyone else who needs a great all in one tool chest for all of the tools in your shop. Make no mistake about it, this thing is not for people who have just a couple of tools laying around. It is meant for anybody who has tons of tools and nowhere to put them. When it comes to being a professional in your trade, the Milwaukee Drawer 16 Tool Chest will definitely give you a helping hand. The Milwaukee Drawer 16 Tool Chest comes in 2 separate packages, one which contains the upper tool chest and the other which contains the rolling cabinet on the bottom. It weighs close to 250 pounds, so definitely it is only meant for in shop or at home use. You are not going to be lugging this thing around with you. It has 16 drawers, a computer shelf, and tons of space in the top tool box for ample tool storage. It is detachable and comes complete with wheels for maneuverability. When it comes to features, the Milwaukee Drawer 16 Tool Chest has a whole lot of them, so let’s quickly go over the most important ones. First off, this tool chest and cabinet combo is detachable. This is convenient because you can separate the top chest to take with you when you need to go to a jobsite. You can take all of the most essential tools with you while leaving the not so important stuff for the task behind in the larger cabinet. Of course, you can keep both stacked on top of each other for in shop tool storage too. We are not going to get into the dimensions of each and every single drawer here, because that would take forever to list. However, what we can say is that between the bottom cabinet and the top tool box, there is tons of storage space. There are larger drawers which are ideal for saws, drills, and other power tools. There are also plenty of smaller drawers ideal for your hammers, screwdrivers, ratchet sets, and other such tools. There is also a special little shelf that can be extended to fit your laptop when need be. The top tool chest also contains a large top section which has ample storage space for all of the essentials. 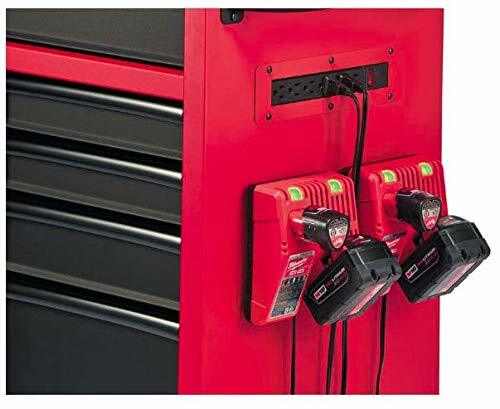 The total holding capacity of the Milwaukee Drawer 16 Tool Chest is 27, 223 cubic feet. 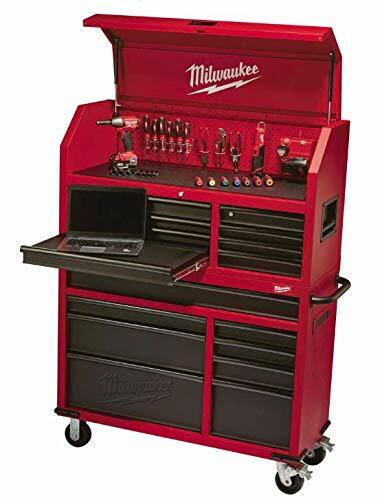 The Milwaukee Drawer 16 Tool Chest is made of solid metal, so you know that it is very durable, plus it has a corrosion, rust, and scratch resistant powder coat finish too. 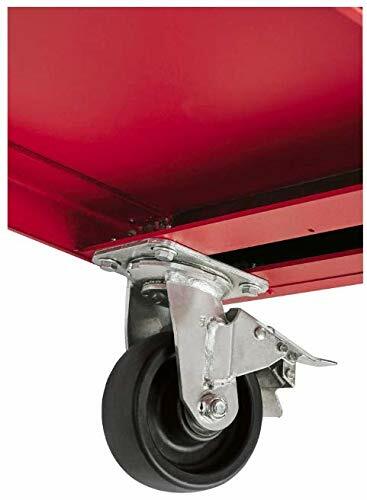 It uses polypropylene fixed and swivel casters that can support a total of 1,800 pounds of tools in total, which is very impressive no doubt. The ball bearing slides on each drawer can support up to 100 pounds each. The 3 barrel key locking system makes sure that your tools stay exactly where they are supposed to be at all times. It also comes with locking wheels for easy transportation, plus the top chest has carrying handles too. All in all, the Milwaukee Drawer 16 Tool Chest is a very fine option to go with for a variety of reasons. If you have too many tools and not enough storage space, this is a great option to keep in mind.